Good morning! Anyone still on a candy/sugar/BBQ/booze high from the weekend?! We had such a nice weekend up in Maine and I’m lucky enough to be working from my parent’s house today- The traffic getting home on Friday was TERRIBLE, so I was not really interested in dealing with that again on Sunday! But, before I recap my weekend, I wanted to share a little about a new-to-me studio/workout that I tried out last week. 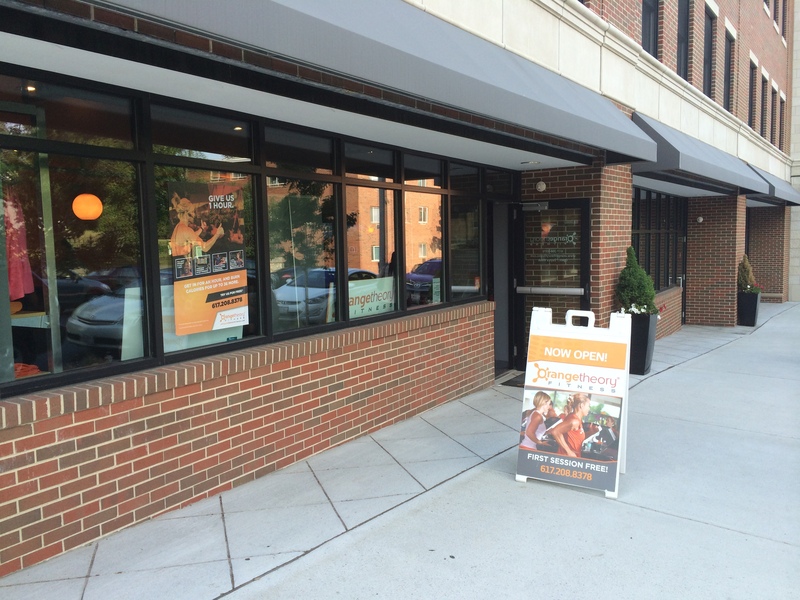 Have you heard of Orangetheory Fitness? They’ve got studios all over the country, but for anyone who is in the Boston area, the most convenient ones for us would be their Brighton or Natick locations. 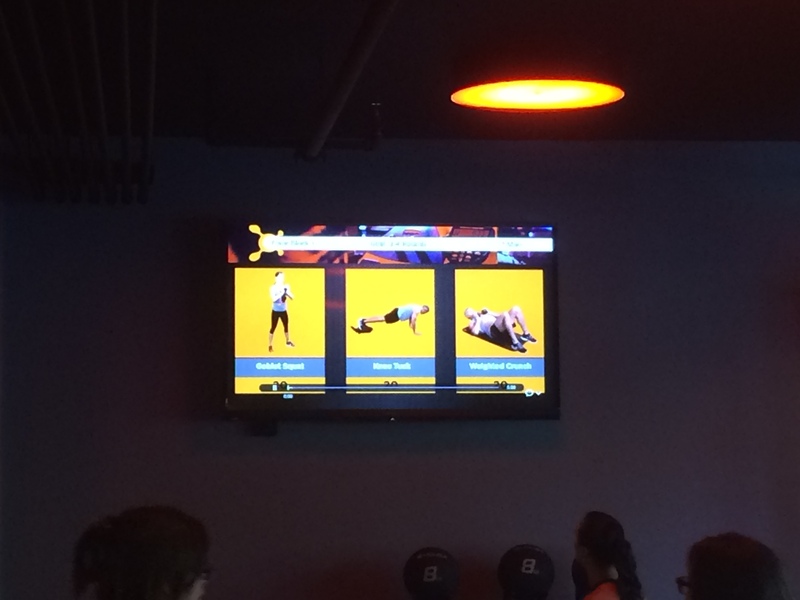 I headed over to the Brighton one last week and although I had learned a little about the workout from my contact there and from their site, I still wasn’t sure what to expect. I was asked to come in 30 minutes before the class, which I thought was interesting since that seemed like a long time, but once I got there and went through all the things we needed to learn, I understood! The whole idea behind Orangetheory Fitness is that you workout with heart rate monitors (that they provide) so that you can track your exertion and work in different heart rate zones throughout the class, which was one of the things that was explained to me when I got there. I’ve worn heart rate monitors before, but decided that they made me too obsessed with numbers and ended up taking away from my workouts so I decided to ditch them. It was interesting (yet addicting!) watching my heart rate numbers and percentages throughout the class. That screen in the top left hand area of the picture is the screen showing everyone’s heart rates (side note- I almost fell off the treadmill once while I was watching my heart rate!). The rest of the room reminded me of Barry’s Bootcamp, except Barry’s doesn’t have rowers. 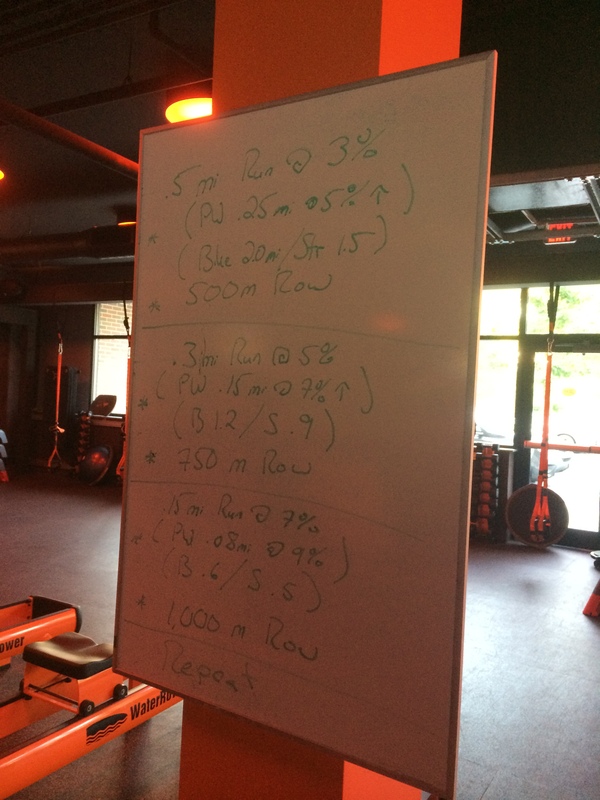 I have never been a big rower, so I have to say that was a challenging part of the workout for me! They have the water rowers which are something I’ve never used before… but LOVED them because they were so much smoother than the traditional rowers you see at the gym. The classes vary by day (again, similar to Barry’s), and I went on the “Run and Row” day, which meant when we were not doing the weight portion of the class, we were alternating between the treadmill and rowers. My group started with the strength portion first, so let me recap that! It was 3 sets of 3 exercises, all done in AMRAP (as many rounds as possible) format. The first one was goblet squats, plank tucks and weighted crunches, 20 reps each for 7 minutes. It was cool because they have a TV on the wall with video demo’s of the exercises and number of reps- very helpful for an instructor! The next set was single leg deadlifts, side lunges and tricep kickbacks- 8 reps, 6 reps, 8 reps (I can’t remember how long the AMRAP was though- maybe 5 mins?). The last set used the suspension system and we did single leg lunge & hops and then bicycle crunches (6 lunge & hops each leg, 12 total bicycle crunches) for 4 minutes. After that, we switched with the other half of the class and did the “run and row” portion. 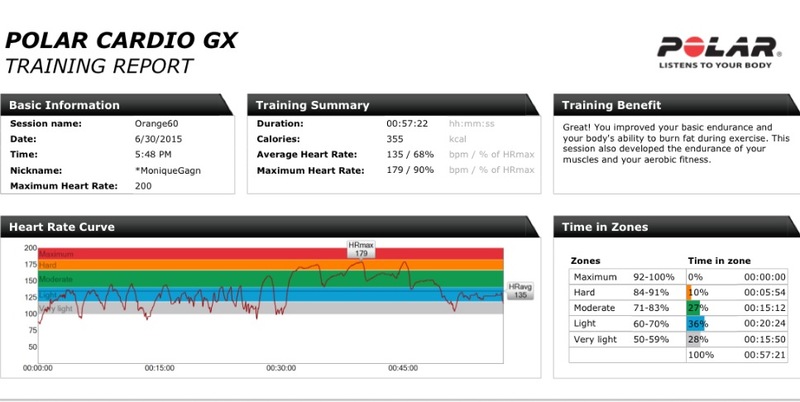 I have to say that I was surprised by how low my heart rate was during the strength session. When I go to the gym on my own, I feel like I’m working so hard, but I didn’t feel that way during the class- not sure why, because they are moves I do often and they weren’t easy, but for some reason I wasn’t working that hard apparently! For the run and row, we were told what we needed to accomplish (both for runners and for power-walkers- I loved that they gave that option! ), but we were allowed to pick our speed. Me, being super competitive (wish I wasn’t this way!! ), pushed myself hard during this section because I wanted to transition first… I have issues! Anyway- we did .5 miles at 3% incline running at a decent pace, then we did a 500M row with a goal of under 2min. completion (I did it in 1:57- just barely made it!). Next set was .3 miles at 5% incline on the treadmill at a faster pace and then 750M row, keeping at the same pace we did for the 500M- this was hard!! Lastly, we sprinted .15 miles at a 7% incline and rowed for 1000M. This portion of the class was definitely the hardest for me and was the only time I found myself in the “orange” zone, which they really want you to be in for 12-20 minutes of the class. We reviewed our reports with the instructor after class and she explained that the reason why I didn’t stay up in the orange/red area as much as they suggest is because I teach fitness and am very active, in other words, it takes more to get my heart rate up. Makes sense! While I didn’t burn close to the average calorie burn, I still left there feeling like I had a great workout, plus the after burn effects of this workout are supposed to be great! The instructor, Kerri, was great at showing people more advanced and less advanced options and I enjoyed how we finished the class with fun partner core-work. I even copied her and did that in my class last week! All in all, I really enjoyed my first workout at Orangetheory and am excited to go back! Classes are 60 minutes and the workouts change each day, making it so you can go every day if you want. They do have some 45 minute classes during the lunch-break hour. I don’t think there was a specific parking lot for OTF, but there is plenty of street parking on Market Street in Brighton. They have 2 showers with some shower products- not towels, though. They have 2 bathrooms and a water fountain. 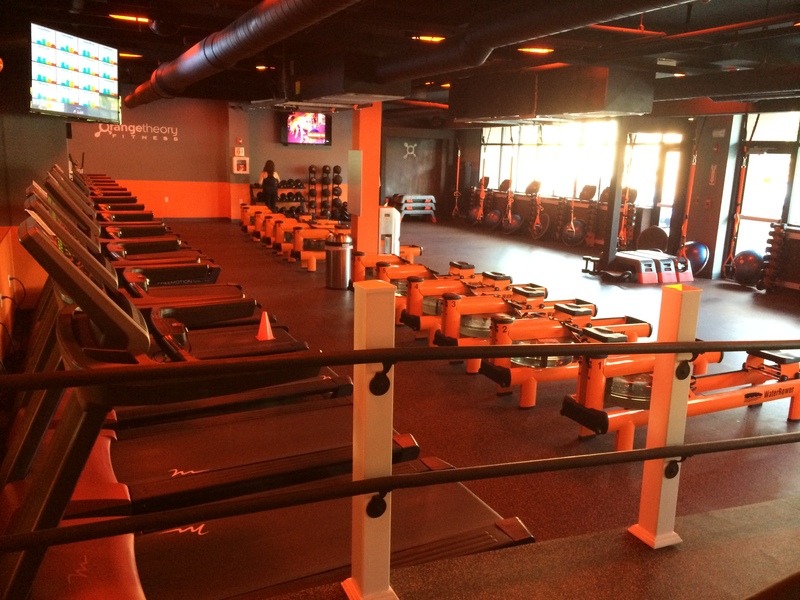 Questions for you: Have you ever been to an Orangetheory Fitness class? What’s your favorite class to go to? What’s something you look for in a new studio? Do you like wearing a heart rate monitor? A few of those opened up here a while ago and I wanted to try it out (Was pregnant when I first noticed the studio) I’m still going to wait a few more weeks before trying because I wanted to get a bit more in shape before attempting a treadmill! Oh, fun! You should definitely go once you’re feeling up to it. The good thing about the class is you can usually do your own speed, so it’s good if you’re tired or need to go slower!